I found several different versions of this idea, but this is the one that I followed, because it was the easiest and seemed most like what I wanted to achieve. I was only going to do one jar, because I wanted to see how this came out. I have to admit, I was a little unsure if this was really going to come out as good as it seemed, because this just struck me as too good to be true. Surely it was more difficult than this! 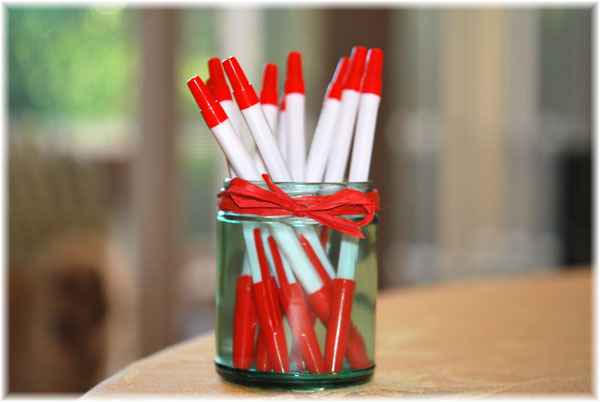 The most difficult thing turned out to be getting the label off of the smaller jar. For some reason even my standard procedure didn’t take all of the sticky off of it. I tried the special Tape Remover I had bought, and still had residue. I did a little internet research and someone recommended the Mr Clean Magic Eraser. Fortunately I had some. That with some elbow grease did take it off. Whew! I washed the jar and dried it. Before I did anything else I turned on the oven. The directions say she used her lowest setting, 150 degrees. My oven would not go below 170, so that was the setting I had to use. 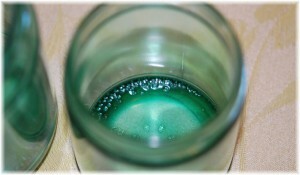 Next, I poured enough Mod Podge into the bottom of my jar and added 3 drops of blue food coloring and 2 drops of green. The directions said to add a little water and mix it well. OK, well, with what? I looked around and decided to use my orange peeler. After all, it’s Mod Podge, it will clean up. I mixed it well, making sure the color was completely mixed. 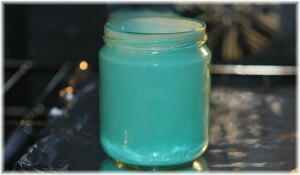 The consistency needs to be thin enough to coat the jar, but thick enough to stick, so you will have to gauge that. It doesn’t take much water, so don’t get carried away! 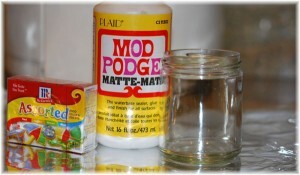 Move the jar around and let the Mod Podge mixture coat the inside of the jar. The most difficult part, for me, was the top. I got some on the outside, and I tried to wipe that off. I discovered that I had quite a bit extra, and I had some more jars, so I did one more. After I coated that one, I had only a small amount of Mod Podge left so I just poured it into a plastic tub to throw out. I don’t like to pour that sort of thing down my sink. 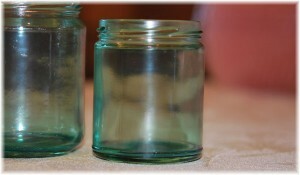 I put both of the jars on a foil lined cookie sheet (an old one) and popped them into the pre-heated oven. The instructions indicated about twenty minutes, but after about twenty minutes I checked, and while they looked pretty good, the bottom wasn’t really finished. But that’s because I realize, after the fact, that I left too much puddled in the bottom of the jars. Next time I’ll be careful about that! So, I just kept cooking and checking until they looked like I wanted them to. And they looked great! I was so happy with them. The larger jar was not as perfect, but I didn’t really have quite enough Mod Podge, because I wasn’t planning to make 2 of them. However, next time I will make several at a time, and make plenty. The color is incredible, and I think you could do them in other colors, so that will be the next thing I will attempt. I also wonder if there’s something you could spray onto this to make it scratch proof. I have not had the heart to see if it would stand up to scratching, but something tells me it wouldn’t. So, I plan to be careful with it. Here you can see the result of too much Mod Podge puddled in the bottom of the jar. Perhaps also the higher cooking temperature. I wondered about that as well. Still, it’s a minor thing, and I will just be more careful next time and pour more of it out. I don’t think you can get it wet, maybe. If I make some more, I might make one and then experiment with it. I just don’t want to ruin this one. Can you combine this and the etching? Wow! Didn;t even think that there would be a way to do this – will have to give it a try – thanks so much! I love these, I was told to use outdoors mod mod podge and paint the outside for a more sturdy glass, also to antique the lids you can use have vinegar and half bleach, put the lids in and watch them rust up. That sounds interesting. I think if I were going to use them outside I would use the outside Mod Podge, but even so, I think I would protect them from getting wet. I just don’t have good luck with Mod Podge and moisture. Of course here in Florida it’s so humid and wet all the time. It may be different if you live in a dryer climate.